Reason for Reading: Raves at BookCrazy. 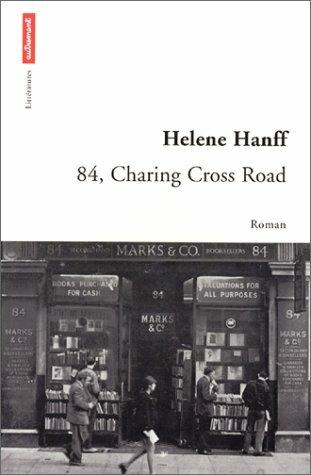 Synopsis: New Yorker Helene Hanff begins twenty years of correspondence when she writes to a bookstore in London, asking them to find (cheap) used books for her. Soon Hanff is sending them packages, as they can’t find eggs and other foods in post-war England, and everyone at the bookstore is writing Hanff, as they find all of their lives oddly intertwined by letters. Why you should read this book: If you’re a bibliophile, you’ll enjoy hearing about all of the books Hanff requests and her longing for the best copies she can acquire at cheap prices. Charming and sweet. Why you should avoid this book: For such a short book, there is a lot of repetition due to the nature of the letters. All of the books Hanff asks for are ‘classics,’ and a large number of them are obscure, which may cut down somewhat on appreciating her joy at getting the books. Your ad in the Saturday Review of Literature says that you specialize in out-of print books. The phrase ‘antiquarian booksellers’ scares me somewhat, as I equate ‘antique’ with expensive. I am a poor writer with an antiquarian taste in books and all the things I want are impossible to get over here except in very expensive rare editions, or in Barnes & Noble’s grimy, marked-up schoolboy copies. he has a first edition of Newman’s University for six bucks, do i want it, he asks innocently. Yes, I want it. I won’t be fit to live with myself. I’ve never cared about first editions per se, but a first edition of THAT book-! Send the Oxford Verse, too, please. Never wonder if I’ve found something somewhere else, I don’t look anywhere else any more. Why should I run all the way down to 17th St. to buy dirty, badly made books when I can buy clean, beautiful ones from you without leaving the typewriter? From where I sit, London’s a lot closer than 17th Street. Prepare yourself for a shock. ALL THREE of the books you requested in your last letter are on the way to you, and should arrive in a week or so. Don’t ask how we managed it – it’s just a part of the Marks service. Our bill is enclosed herewith showing balance due of $5.00. Two of your friends dropped in to see us a few days ago and now I have forgotten their names – a young married couple and very charming. Unfortunately they only had time to stop and smoke a cigarette as they were off again on their travels next morning. Also recommended: Book Business: Publishing Past Present and Future by Jason Epstein; Book Lust by Nancy Pearl. Also by this author: Q’s Legacy; Apple of My Eye; Underfoot in Show Business; Letter From New York: BBC Woman’s Hour Broadcasts; The Duchess of Bloomsbury Street. Respect to those who put a dash between sentences and the exclamation mark-!